this yr's map has changed considerably but i can't get a link posted as this PC used to be Noah's (i.e. it's old). there's a new pedestrian gate where VG4 used to be so that's gonna make it easier to get round to the Park field - meaning it may fill up sooner. Wed am,ers should be ok though - just look for the fat, out of breath girl trying to pitch a 6 man by herself ...... usually stripped down to the bra cos my blood pressure's high and i'm boiling inside my own skin! Hilarious! Betsy that was my first chuckle of Wednesday morning muchas gracias! Listen, i'm no expert but i'll give you a hand with yer tent - will you be there on Wed am? Having slight crisis moment as my ex still thinks i should go with him (in his caravan) I have to say, it is slightly appealing thinking i would be able to sleep in a semi proper bed... however this would mean being glued to him for the entire weekend... hmmmmm....Any pearls of wisdom out there? p.s Working from home today, GET THE HELL IN! Posts: 1434 I'd only say that if you stay in the campervan field it's a bit isolated from the festival generally. Hello people, i'm new on here but generally a re-generate (not de-generate) for Glastonbury! I'm male, 32 and reasonably sensible these days (yeah right)!! 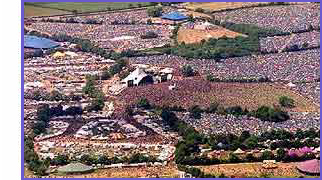 I have done lots of festivals and always compared them to Glastonbury 1993, 1994, 1997 and 1998! Thing is, i got mugged and had a bad experience in 1998 and haven't returned since. Got my second wind last year and went to V2007 which was okay but it's just not Glastonbury. Problem is (and reason for my post on here) is i'm going alone. All of my mates have grown up and i haven't is probably the simple truth. I used to bugger off on my own when i used to go with them anyway so shouldn't be any different?!?!? However, would be good to hook up with some people i can trust to keep an eye out for my tent and stuff in retrun for likewise. I'll be going down on the Thursday afternoon/evening so if anybody wants to let me know where the 'GOING ALONE' crew are pitching would be grateful. Posts: 30 So, do we have our own field organised yet? Which is a very good point actually Toby, perhaps one of our more seasoned Glastonbury attendees could advise on the best spots, anyone???? Posts: 1434 Have a shufty at the posts in this thread in regards where to camp. I believe the intention to to camp where we've been in recent years. Sorry KING MOB, i've had a 'shufty' and can't find anything or anywhere suggesting where you have camped in the past. As i say, i haven't been since 1998 and i used to camp in either Top Webs Ash or Row Mead fields. Going alone but still excited...anyone feel the same?!?!?!? Posts: 2 Hey I'm going on my own as well, or at least to begin with I am! My other half can't get time off work so I'm all alone until Friday evening! It's great to know I'm not the only one trapsing around on my own! it's been safe, 1 minor tent rummage, fun and relatively easily accessible for other, tiny-t, greenfields etc as it's right by the railway. i'll certainly b there on wed am and would appreciate any strong boys (not being sexist, just leery) 2 help me pitch etc...... has any1 noticed this appears 2 b a recurring theme? oooo - i'm getting excited now!